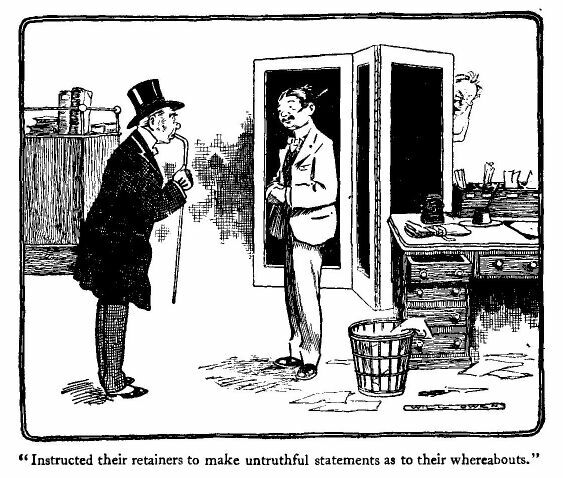 Mr. Chalk's anxiety during the negotiations for the purchase of the Fair Emily kept him oscillating between Tredgold and Stobell until those gentlemen fled at his approach and instructed their retainers to make untruthful statements as to their whereabouts. Daily letters from Captain Brisket stated that he was still haggling with Mr. Todd over the price, and Mr. Chalk quailed as he tried to picture the scene with that doughty champion. Three times at the earnest instigation of his friends, who pointed out the necessity of keeping up appearances, had he set out to pay a visit to Dialstone Lane, and three times had he turned back half-way as he realized the difficult nature of his task. As well ask a poacher to call on a gamekeeper the morning after a raid. Captain Bowers, anxious to see him and sound him with a few carefully- prepared questions, noted his continued absence with regret. Despairing at last of a visit from Mr. Chalk, he resolved to pay one himself. Mr. Chalk, who was listening to his wife, rose hastily at his entrance, and in great confusion invited him to a chair which was already occupied by Mrs. Chalk's work-basket. The captain took another and, after listening to an incoherent statement about the weather, shook his head reproachfully at Mr. Chalk. "I thought something must have happened to you," he said. "Why, it must be weeks since I've seen you." "Yes," said Mr. Chalk, with an effort, "so I did, but half-way to yours I got a nail in my shoe and had to come home." "Home!" exclaimed his wife. "Why, you were gone two hours and thirty-five minutes." "It was very painful," said Mr. Chalk, as the captain stared in open-eyed astonishment at this exact time-keeping. "One time I thought that I should hardly have got back." Mrs. Chalk looked at him, but, except for a long, shivering sigh which the visitor took for sympathy, made no comment. "I often think that I must have missed a great deal by keeping single," said the latter. "It must be very pleasant when you're away to know that there is somebody at home counting the minutes until your return." 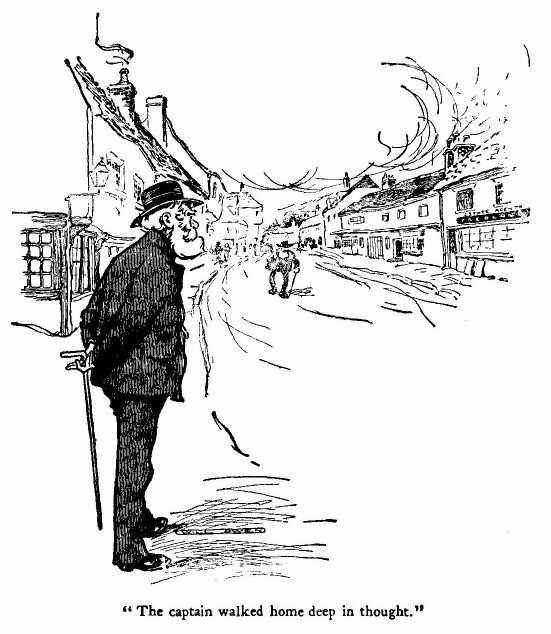 Mr. Chalk permitted himself one brief wondering glance in the speaker's direction, and then gazed out of window. "There's no companion like a wife," continued the captain. "Nobody else can quite share your joys and sorrows as she can. I've often thought how pleasant it must be to come home from a journey and tell your wife all about it: where you've been, what you've done, and what you're going to do." Mr. Chalk stole another look at him; Mrs. Chalk, somewhat suspicious, followed his example. "It's a pity you never married, Captain Bowers," she said, at length; "most men seem to do all they can to keep things from their wives. But one of these days——"
She finished the sentence by an expressive glance at her husband. Captain Bowers, suddenly enlightened, hastened to change the subject. "I haven't seen Tredgold or Stobell either," he said, gazing fixedly at Mr. Chalk. "They—they were talking about you only the other day," said that gentleman, nervously. "Is Miss Drewitt well?" "Quite well," said the captain, briefly. "I was beginning to think you had all left Binchester," he continued; "gone for a sea voyage or something." Mr. Chalk laughed uneasily. "I thought that Joseph wasn't looking very well the last time I saw you," he said, with an imploring glance at the captain to remind him of the presence of Mrs. Chalk. Mr. Chalk started and said that he was glad to hear it, and sat trying to think of a safe subject for conversation. "Joseph's a nice parrot," he said at last. "The parrot's a nice lad, I mean." "Joseph-is-a-nice-lad," said Mr. Chalk, recovering himself. "I have often thought——"
The sentence was never completed, being interrupted by a thundering rat-tat-tat at the front door, followed by a pealing at the bell, which indicated that the visitor was manfully following the printed injunction to "Ring also." The door was opened and a man's voice was heard in the hall-a loud, confident voice, at the sound of which Mr. Chalk, with one horrified glance in the direction of Captain Bowers, sank back in his chair and held his breath. The captain came in with a light, bustling step, and, having shaken Mr. Chalk's hand with great fervour and acknowledged the presence of Captain Bowers and Mrs. Chalk by two spasmodic jerks of the head, sat bolt-upright on the edge of a chair and beamed brightly upon the horrified Chalk. "I've got her," continued Captain Brisket, with an air of great enjoyment; "and a fine job I had of it, I can tell you. Old Todd said he couldn't bear parting with her. Once or twice I thought he meant it." Mr. Chalk made a desperate effort to catch his eye, but in vain. It was fixed in reminiscent joy on the ceiling. "We haggled about her for days," continued Brisket; "but at last I won. The Fair Emily is yours, sir." "The fair who?" cried Mrs. Chalk, in a terrible voice. "Emily who? Emily what?" Wrath and astonishment held her for the moment breathless. Mr. Chalk, caught between his wife and Captain Bowers, fortified himself with memories of the early martyrs and gave another warning glance at Brisket. For nearly two minutes that undaunted mariner met the gaze of Mrs. Chalk without flinching. "A—a secret?" gasped the indignant woman at last, as she turned to her husband. "You sit there and dare to tell me that?" Mrs. Chalk controlled herself by a great effort and, turning to Captain Brisket, addressed him almost calmly. "Was it Emily that came whistling over the garden-wall the other night?" she inquired. "Whis—-?" said the hapless Brisket, making a noble effort. He finished the word with a cough and gazed with protruding eyes at Mr. Chalk. The appearance of that gentleman sobered him at once. "Because she can't whistle," replied Captain Brisket, feeling his way carefully. "And what's more, she wouldn't if she could. She's been too well brought up for that." He gave a cunning smile at Mr. Chalk, to which that gentleman, having decided at all hazards to keep the secret from Captain Bowers, made a ghastly response, and nodded to him to proceed. "What's she got to do with my husband?" demanded Mrs. Chalk, her voice rising despite herself. "I'm coming to that," said Brisket, thoughtfully, as he gazed at the floor in all the agonies of composition; "Mr. Chalk is trying to get her a new place." Captain Brisket nodded. "She ain't happy where she is," he explained, "and Mr. Chalk—out o' pure good-nature and kindness of heart—is trying to get her another, and I honour him for it." He looked round triumphantly. Mr. Chalk, sitting open-mouthed, was regarding him with the fascinated gaze of a rabbit before a boa-constrictor. Captain Bowers was listening with an appearance of interest which in more favourable circumstances would have been very flattering. "You said," cried Mrs. Chalk—"you said to my husband: 'The fair Emily is yours.'" "So I did," said Brisket, anxiously—"so I did. And what I say I stick to. When I said that the—that Emily was his, I meant it. I don't say things I don't mean. That isn't Bill Brisket's way." "And you said just now that he was getting her a place," Mrs. Chalk reminded him, grimly. "Mr. Chalk understands what I mean," said Captain Brisket, with dignity. "When I said 'She is yours,' I meant that she is coming here." "That is, if her mother'll let her come," pursued the enterprising Brisket, with a look of great artfulness at Mr. Chalk, to call his attention to the bridge he was building for him; "but the old woman's been laid up lately and talks about not being able to spare her." Mrs. Chalk sat back helplessly in her chair and gazed from her husband to Captain Brisket, and from Captain Brisket back to her husband. Captain Brisket, red-faced and confident, sat upright on the edge of his chair as though inviting inspection; Mr. Chalk plucked nervously at his fingers. Captain Bowers suddenly broke silence. Captain Brisket stopped dead and, rubbing his nose hard with his forefinger, gazed thoughtfully at Captain Bowers. 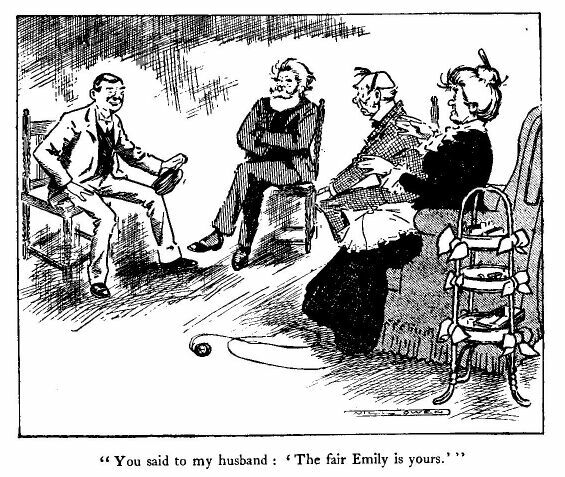 "The Fair Emily is a ship," said the latter to Mrs. Chalk. "A ship!" cried the bewildered woman. "A ship living with her invalid mother and coming to my husband to get her a place! Are you trying to screen him, too?" "It's a ship," repeated Captain Bowers, sternly, as he sought in vain to meet the eye of Mr. Chalk; "a craft of two hundred and something tons. For some reason—best known to himself—Mr. Chalk wants the matter kept secret." "It—it isn't my secret," faltered Mr. Chalk. Captain Brisket laughed noisily and, smacking his leg with his open hand, smiled broadly upon the company. No response being forthcoming, he laughed again for his own edification, and sat good-humouredly waiting events. "Then why didn't you tell me, instead of sitting there listening to a string of falsehoods?" "I—I wanted to give you a surprise—a pleasant little surprise," said Mr. Chalk, with a timid glance at Captain Bowers. "I have bought a share in a schooner, to go for a little cruise. Just a jaunt for pleasure." "I wanted to keep it secret until it had been repainted and done up," continued Mr. Chalk, watching his wife's face anxiously, "and then Captain Brisket came in and spoilt it." "That's me, ma'am," said the gentleman mentioned, shaking his head despairingly. "That's Bill Brisket all over. I come blundering in, and the first thing I do is to blurt out secrets; then, when I try to smooth it over——"
Mrs. Chalk paid no heed. Alluding to the schooner as "our yacht," she at once began to discuss the subject of the voyage, the dresses she would require, and the rival merits of shutting the house up or putting the servants on board wages. Under her skilful hands, aided by a few suggestions of Captain Brisket's, the Fair Emily was in the short space of twenty minutes transformed into one of the most luxurious yachts that ever sailed the seas. Mr. Chalk's heart failed him as he listened. His thoughts were with his partners in the enterprise, and he trembled as he thought of their comments. Mr. Chalk, about to speak, checked himself and blew his nose instead. The romance of the affair was beginning to evaporate. He sat in a state of great dejection, until Captain Bowers, having learned far more than he had anticipated, shook hands with impressive gravity and took his departure. The captain walked home deep in thought, with a prolonged stare at the windows of Tredgold's office as he passed. The present whereabouts of the map was now quite clear, and at the top of Dialstone Lane he stopped and put his hand to his brow in consternation, as he thought of the elaborate expedition that was being fitted out for the recovery of the treasure. Prudence, who was sitting in the window reading, looked up at his entrance and smiled. "I don't know," said his niece; "I didn't see him. I was upstairs when he came." Despite his sixty odd years the captain turned a little bit pink. "I hope you are better now," he said, at last. "Oh, yes," said his niece; "it wasn't very bad. It's strange that I should have a headache so soon after you; looks as though they're in the family, doesn't it?" Somewhat to the captain's relief she took up her book again without waiting for a reply, and sat reading until Mr. Tasker brought in the tea. The captain, who was in a very thoughtful mood, drank cup after cup in silence, and it was not until the meal was cleared away and he had had a few soothing whiffs at his pipe that he narrated the events of the afternoon. "There!" said Prudence, her eyes sparkling with indignation. "What did I say? Didn't I tell you that those three people would be taking a holiday soon? The idea of Mr. Tredgold venturing to come round here this afternoon!" Miss Drewitt shook her head obstinately. "We shall see," she remarked. "The idea of those men going after your treasure after you had said it wasn't to be touched! Why, it's perfectly dishonest!" The captain blew a cloud of smoke from his mouth and watched it disperse. "Perhaps they won't find it," he murmured. "They'll find it," said his niece, confidently. "Why shouldn't they? This Captain Brisket will find the island, and the rest will be easy." "They might not find the island," said the captain, blowing a cloud so dense that his face was almost hidden. "Some of these little islands have been known to disappear quite suddenly. Volcanic action, you know. What are you smiling at?" he added, sharply. "Thoughts," said Miss Drewitt, clasping her hands round her knee and smiling again. "I was thinking how odd it would be if the island sank just as they landed upon it."